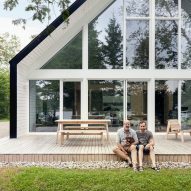 Living spaces are enclosed in a plywood box nested inside an expansive gabled volume in this Canadian lakeside property by La Shed Architecture. 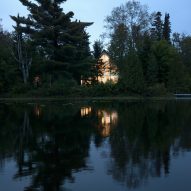 The Chalet de la Plage – or Beach Chalet – is located on the shores of a lake in the Laurentians region of Quebec. The natural retreat was built for a couple seeking to escape the city. "It's a peaceful, comfortable and inspiring place where the clients can practice their favourite pastimes – photography, watercolour painting, and music," said Montreal-based firm La Shed. The overall form of the home is based on traditional Canadian cabins. "The Chalet de la Plage integrates into its environment by borrowing from typical local forms," explained the studio. "Simple, refined details create a resolutely contemporary architecture that sets it apart from similar chalets from another era." 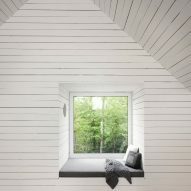 The black cabin is accessed through an opening carved out of its northwestern corner. This leads into the main living space, which encompasses the entire main structure. 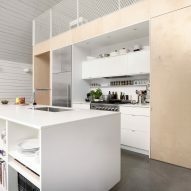 Inside, crisp white walls contrast the exterior's materiality. An open-concept living room, kitchen, and dining room are contained under the steeply-pitched roof. The architects located the client's private quarters inside a plywood volume that occupies the northern part of the house. It includes their bedroom, bathroom, and utility spaces. A staircase carved out of this box leads to a mezzanine level, where a secondary living room looks out onto the one below. "The large platform is used as a home office, guest quarters, and a space for contemplation and creativity," said the architects. The southern facade opens towards the lake, and is glazed from floor to ceiling, embracing the form of the home's steep gabled roof. "The expansive opening projects the main living spaces out to the terrace, and draws one's gaze to the lake," said the firm. The building's large opening is covered by a roof overhang, which allows in light during cold winter months while shading the home in the summer. The concrete slab that supports the structure retains heat in the winter, yet helps keeps the home cool during summer months. 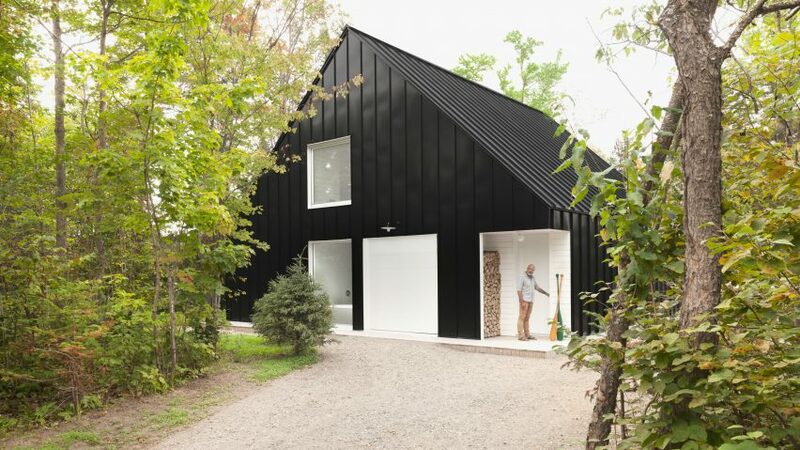 Canada is home to a variety of black cabins, including the fairytale-inspired retreat in the woods and a residence that lies within earshot of the ocean.